Four years ago, my son came home from a 3-day YMCA Model United Nations Conference. Despite his exhaustion, he was more passionate, driven and motivated than he ever had been. This was notable because he was already very involved with extracurricular activities and I didn't think it was possible for him to get more involved. He talked about the new friends he made, and how he learned so many new things. While he tried to catch up on homework and sleep, I went through his luggage to gather all the laundry and I discovered that he received several awards. The next day I asked him about the awards, and told him that we were so proud of his accomplishments, but all he could talk about was the friendships he made at the conference. That was the beginning of my son's 4 year experience with the YMCA Model United Nation’s family. On January 4, 2013, my husband and I attended the conference for the first time. 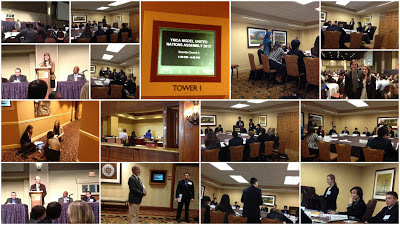 It was my son's last year as a student delegate, as he’s going off to college in August. It was his second year as Chairman of Security Council, and all the student leaders are allowed to invite their parents to observe the event and stay overnight, so he encouraged us to come. The event is held at The Hershey Lodge in PA, which is a beautiful hotel and convention center. The YMCA advisers/coordinators showed the parents around the Lodge and gave us an overview of what goes on at the conference. This conference was attended by almost 1600 student delegates from various schools in the northeast. The student leaders had been planning the event for 9 months. The preparation involved multiple weekend trips to Burlington, NJ, where the student officers meet for many hours preparing every detail of the conference. 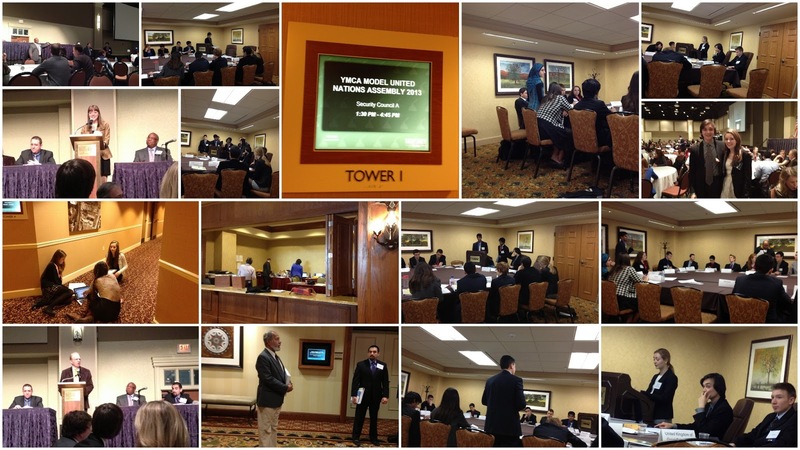 Their hard work and attention to detail resulted in very well organized and successful conference. This year's theme was "Youth Empowerment". From what I observed in the conference rooms, hallways, and in the massive main auditorium, the theme was successfully implemented. Every student represented a country, and by the time the conference began, each student had done extensive research on their country. Each delegation exuded a sense of pride. Each student is guided through a process of sharing opinions, formulating arguments, and working with team to further the objectives they had prepared. At one of the Security Council sessions that I attended, it was interesting to see how the students worked hard to adhere to certain protocols (parliamentary procedure) when debating or presenting their resolutions. The way they addressed each other in conference was very respectful and professional, reflecting the depth of maturity and future potential embodied by them all. The conference also emphasized character building and the importance of family and the community. "Peace begins with the family." said one of the advisers who had worked at the United Nations. He reminded the parents that “talks around the dining room table” are as important as talks inside the walls of the UN. Lunch is held in the Grand Ballroom, which is a massive room, large enough for all 1800 attendees. During lunchtime, a variety of speakers would make presentations. In the lunch we attended, the speakers talked about the importance in giving back to the community in some way - be it financially, or through volunteer work or advocacy. One of the students who lead this year's service project, "Soles for Souls", fully engaged the emotions of the entire room. Her good-natured enthusiasm, sunny disposition, and leadership in the effort, was representative of the entire delegation. The experience assured me that this wonderful group of young adults care not only about themselves, but also care deeply about making a difference to the lives of others. In a time where we are bombarded by the media with sad news about violence and irrational behavior, it was heart-warming to see that there are plenty of young people who are driven and passionate, polite and respectful. Winston Churchill once said that "We make a living by what we get, we make a life by what we give." Based on what I observed at the conference, there are many young people who are pursuing wonderful lives. As my son said to his committee members: "After the conference, you will experience a post-MUN rush. You will feel like your brain is on fire. You will be moving so fast. You will be driven. You will realize that by empowering yourself, you are also empowering the people around you. It's not about what your strength or passion or strength is, or why you are strong and passionate, it is about you taking action and making things happen. This is empowerment and that's what matters." This is a very inspiring account of what actually takes place at the Model United Nations events. The dedication and commitment of our children to the betterment of the world stage, is awe inspiring. I commend them all. Thank you for bringing it to life.